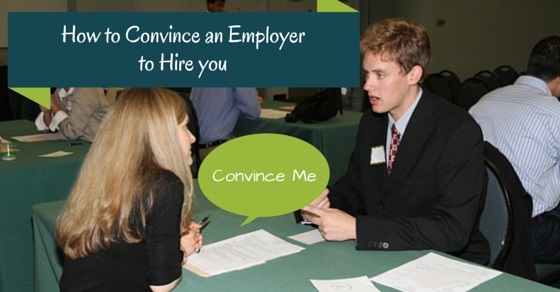 How to Convince an Employer to Hire You? Most candidates go to the interview fearing the unknown or at least knowing only a bit about what to expect. How do you turn this around and make a strong case to convince the employer to hire you? When you meet an employer for an interview, you will be competing with numerous other candidates with the similar qualification and experience for the same job. If you really want to have a decent shot at converting this opportunity you need to be able to differentiate yourself and make a strong impression. The employer must be able to see that spark which will make them believe that you will be a welcome addition to their organization. Those 30 minutes in the interview room must be well prepared, well-managed and with a clear focus and intent. To make those 30 minutes in the interview room work for you, apply some of these suggestions so that the interview is conducted around your strengths making a strong case for you to get hired. The first impression is what usually counts. Don’t even consider the thought of dressing up casually for an interview. A well-dressed candidate demonstrates intent and enthusiasm for the job. Anything else, implies a lack of seriousness towards the opportunity. Formal wear works best in most cases. Safer choices works best as the risk reward is in your favor. Dressing adventurously may impress only some people, but the interview discussion is the key to the job, not the dress. So make a safer choice. Not everybody is born a genius. In fact even geniuses had a hard time impressing people around them. Albert Einstein for example was dyslexic when he was a kid and had a tough time getting decent grades in school. So, if you are not a genius, the next best thing is to demonstrate that you learn fast. This implicitly suggests, that you will make mistakes but you will never repeat them. So have examples in your career or life ready of instances where you learnt stuff fast and made an impact. You should be able to convince your employer that hiring you will help move things along and that your contribution will make an impact in the organization. A resume is probably the reason why you have an interview. An impressive, well written resume can help drive the direction of the interview. Most candidates do not understand the implication of this. The interview is a discussion built around your resume. Write stuff you can defend very well and talk passionately about. Writing about your achievements in third grade don’t help. What you achieved and contributed in the face of challenges in your previous job will probably be more important and get talked a lot. For an employer going to know that someone credible is willing to recommend you is invaluable validation of your capability. Especially if that someone credible is a past employer, teacher, mentor or a person who would have spent time assessing your work. Now, you just need to ask them to write a reference letter for you. In your bag of tricks to impress a potential employer, this is as important a tool as any. This can be achieved through a letter of reference, that is submitted along with the resume or at the time of the interview and most often than not after the interview is completed and the employer specifically asks for references. In today’s world, the way to make it happen is to have enough recommendation on your LinkedIn Profile. Most employers anyway review your profile before they consider you for an offer. Having high quality recommendations from your previous supervising managers will add that extra edge to your candidature. This is easily the best way to impress any potential employer. This is also the toughest and double edged one if not done properly. To do this well, you have to spend time understanding and internalizing as much information about the company as possible. The history, the values, the future plans, the stated strategy and the publicly available comments made by the leadership of the company. If you internalize all these well, you should then define the goals you can set yourself at the company and the areas of contribution. Construct the goals around the goals of the company. All this information will be useful when you talk about the different opportunities available with the employer. This sort of preparation makes the employer implicitly understand that you have spent time and energy understanding about the company and its plans and are serious about considering a career with them. If you have pursued any certification or higher academic course that makes sense to the employers area of work, do mention it. A certificate will build your credibility over other candidates. Getting a certification takes time, energy and a lot of motivation. Specially if you have juggled that at the time of working elsewhere. With an extra edge of learning, the employer may just tip the scales in your favor. Most companies tend to reward employees with additional education qualification with extra compensation or provide opportunities for promotion on the basis of additional qualification. The extra qualification sets up for higher salaries and potentially more promotions in the future. One of the important discussions at the interview will be about your previous employment. You can either be very dry or boring about this or you can highlight them appropriately with the achievements you had at work. Talk about your experience in the interview with an achievement led tone as opposed to just describing your day to day activity. Let the interviewer visualize the impact you had at your previous employer. Many employers build their organizations around strong values. Understanding the value system of the employers is critical to know what kind of employees they are likely to hire. Many organizations the world over have a strong “working for the greater good” value system, want that their candidates give them more than they can get from others. Any social service or work done as part of community development, corporate social responsibility sets you apart as a more rounded individual with a multi-dimensional personality. This sets you apart from the other candidates. Employers tend to hire people who are not only able to fulfill their jobs they are hired for now but also to step and grow to leadership positions in the future. Hiring is a very expensive and the longer someone stays in the organization the more implicit contribution he/she makes to it. The person interviewing you will therefore not just assess you about what you can do today but whether you can be the leader of tomorrow. So in your interview discussions use the opportunity in different questions asked of you to highlight examples in your career or life where you took charge and demonstrated leadership abilities. The important thing to highlight here is to mention tasks that are relevant and material to the job. Don’t mention frivolous examples that end up presenting you as a non-serious candidate who takes the matter of leadership lightly. There is nothing like real proof. If you are in certain professions like developers or programmers designers, creative personnel, the best way to impress a potential employer is to showcase your work from projects. There are tremendous opportunities to make an impact with high quality work. These should either be attached to your resume or mentioned in your resume so that the employer can see them online. If you are confident about your work then the interview will most likely be built around the conversation n your work. This is your strength and therefore you will be able to control the direction of the interview. In those twenty-thirty minutes of your interview, your interviewer may want to make crucial decisions about you. That individual has to decide whether you will be able to make an impact on the organization or not. If you have been at the top of the class through your academic career, or a honors student or had a perfect GPA at college, mention it. The education system all over the world still attaches significant importance to academic excellence. Any allied activity built around these like projects, paper presentations, journal publications should also be mentioned. All these highlight that your depth of academic career an create more confidence in the mind of the employer to make a decision to hire you. Remember employers look mostly for confidence, capability and passion. They also want to see how focused you are to get the job. If you are able to demonstrate intent, enthusiasm, the right set of skills and credentials you will make the decision of the employer to hire you much easier.